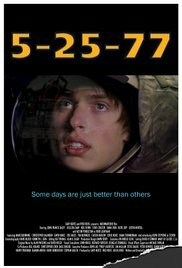 5-25-77 is a coming of age film written and directed by Patrick Read Johnson and produced by Fred Roos and Gary Kurtz. It stars John Francis Daley as a teenage filmmaker living in Wadsworth, Illinois, and his excitement for the premiere of Star Wars on May 25, 1977. Johnson began funding the project in 2001 and filming took place from 2004-2006. Additional shots were filmed in 2015 and 2016, making the filming course span a total of thirteen years. Read more on Wikipedia.